Capital Star Steel is implementing and automated product (steel pipe) tracking system using RFID Technology (Radio Frequence Identification Document). This is to provide traceability and tracking of pipe throughout the manufacturing process. Track the steel pipes from point of origin throughout the manufacturing process to the dispatch and storage area. Maintain a database of all events and location of pipes. The Automatic ID system will provide “real time” automated information of the whereabouts of a steel pipe, date and time of fabrication and exact location in the system. 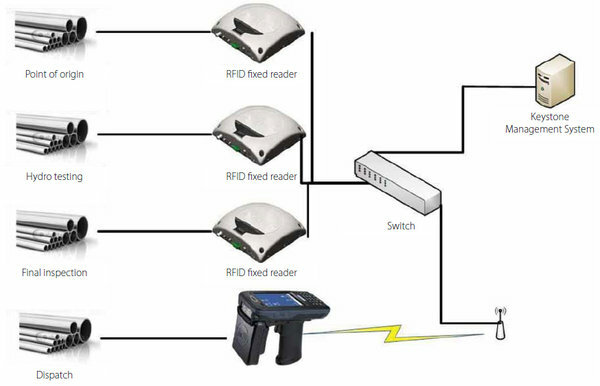 Point of origin RFID fixed reader Hydro testing Switch RFID fixed reader Dispatch Track and trace system configuration Final inspection RFID fixed reader Keystone Management System To enable the traceability of each steel pipe, and RFID tag is applied to each and every steel pipe fabricated. The tag has a unique ID which in turn provides each steel pipe with a unique identifier, which will be tagged at the point of origin. 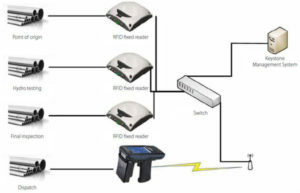 This now provides a realtime database per tag, allowing for retrieval of data at any strategic location by use of fixed RFID readers. Handheld scanners can be used in remote areas, dispatch, cement mortar areas and at customer’s premises to track, locate and identify pipes. As an add on advantage customers can experience the same benefits of pipe tracking and stock holding by utilising the scanning process. Scanners and software to accomplish this will be available from Capital Star Steel.